It has been a few weeks since I shared my Sunday Scoop. I love checking in with the Teaching Trio and friends to see what is on everyone's platter. So...3...2...1....blast off! It has been a busy weekend. I have been lucky enough to have my two girls home from college...so that means our family of 6 is complete for a few days. That also means loads...and when I say loads...I mean I do believe every article of clothing they own coming home to be washed. I hope after a fun photo shoot yesterday with the girls, that I can actually get a picture with all of us for a nice picture I can have of the 6 of us! 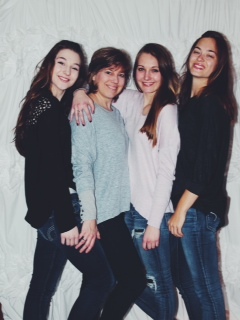 My girls and I...One lucky mom! I have been goal setting and trying to use my time more wisely. 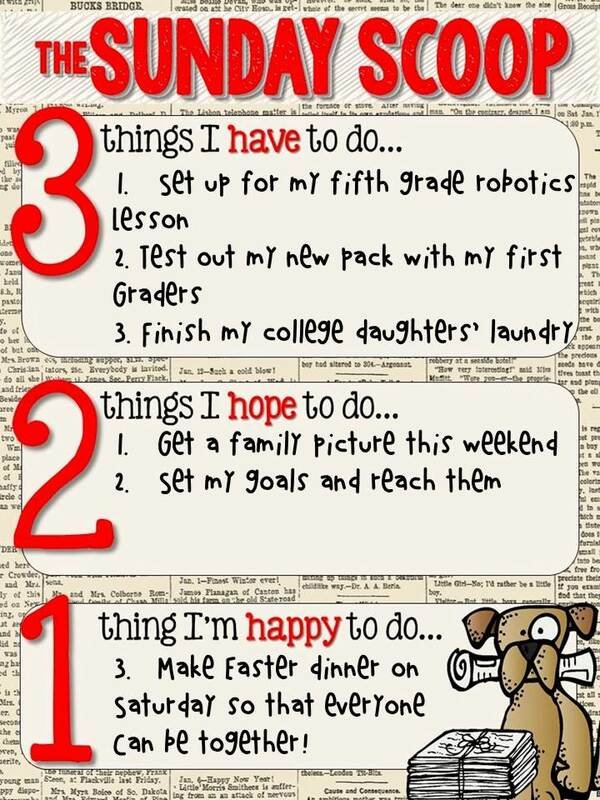 I have to say at first it was easy...make a list stick to it, but it has been harder when there are things at school and at home that change your ability to get work done...new phones at work so training in the morning...spring concert at school gone almost 3 hours... committee meetings this week....and I love my kids home, but I am lucky then if I can check my email and sneak in a quick facebook scroll...I am sure that I can get back on track and get some of my to do list done!!!???! Right? I am getting spring break fever...four days and counting! My family will be home once again next weekend and with boyfriends and their families I want to make sure everyone can be together for a nice meal. That may mean we will have Easter dinner on Saturday. I have learned that it isn't the day that makes the holiday...it's the time you spend together that counts! Beautiful picture! But which is you and which are the girls? Four days and counting over here also! Enjoy your break! Haha...love that comment...I am the second one in. My youngest daughter...then me...then my 19 year old...then my 21 year old. It was so much fun taking the pictures. Lots of giggles! Stop by next week and I will post some pictures of what we make with the dollar store electric toothbrushes! Sounds like a very full week. Enjoy your time with your family. Thanks so much! I don't get them home all at the same time often...I luck out two weeks in a row!!! !